Hi all. I wonder if you can help. 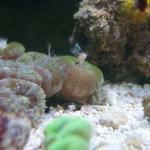 Is it ok to keep khuli loaches with Amanos shrimps? Or will the shrimps come off badly? Should be fine. Amanos are like aquatic roaches and are quite large for micro shrimp. I have both in my tank for several months and no problems. But be aware that the Amanos will steal all the loach pellets and carry it off to eat. So make sure there are enough for everyone. Thanks for the advice - I'm glad they can be kept together. Makes my plans easier!! They get too big to worry about with kuhlis. Observe how confused this peacock gudgeon is over the size of the amano shrimp. I imagine it's thinking something along the lines of, "You HAVE to be kidding me with this thing, right?"